All Kirby Kerr has ever needed on the baseball diamond is an opportunity. And each time he gets a chance, positive results tend to follow. After a successful freshman season at Kirkwood Community College, the 6-foot-1, 185-pound outfielder/pitcher was looking to join a team for the summer. "Cal Clark gave me an in," Kerr said. "I just kept bugging him about it. He texted (Sadler) and he was more than willing to put me on the team." 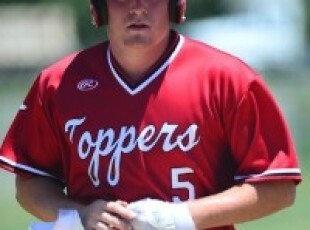 Kerr has become the regular left fielder for the Toppers and also has picked up a save as a pitcher. He is appreciative of the chance to play for Red Top, both on Sundays and in the Wednesday Night League. "On Wednesdays, it's just one game and it doesn't count toward the league record," Kerr said. "It's the same type of baseball, same guys usually. We see some different pitchers, but that's about it.